Mark Wood shone on his international return with a first five-wicket Test haul as England removed West Indies for 154 before building up a 142-run lead at stumps. With England having already lost the three-match series, Wood was recalled for his first Test appearance since May 2018 and made up for lost time with a devastating spell that included a pair of wickets in his first over. Joe Root's team had earlier slumped to 277 all out - having started the day 231-4 - but Wood and Moeen Ali (4-36) tore through the Windies and earned England a 123-run first-innings lead. Rory Burns and Keaton Jennings then saw England to the close with their 10 wickets intact as the tourists enjoyed a rare position of dominance on the second day. A great day for @MAWood33! Look how happy his team-mates are for him! Jos Buttler and Ben Stokes had both made half-centuries on Saturday but the former failed to add to his overnight 67 when bowled by Shannon Gabriel. Stokes moved on to 79 - his best Test score since he was involved in an incident outside a Bristol nightclub in 2017 that resulted in a suspension - but when his mistimed hook off Kemar Roach was brilliantly taken by a diving Shane Dowrich, England unravelled. They would add just 21 runs for the loss of their final five wickets, Roach accounting for Jonny Bairstow, Wood and James Anderson to finish with 4-48, while Moeen gave Alzarri Joseph his second wicket. West Indies openers Kraigg Brathwaite and John Campbell had made 50 partnerships in three of their previous four innings in the series - with the other alliance unbroken at 17 in reaching a victory target - and once again they made a solid start. Anderson eventually played a part in the first wicket, though as the fielder, flying around from cow corner after Brathwaite (12) had launched Moeen into the air. Campbell (41) was pinned in front next ball and West Indies soon went from 57 without loss to 59-4, with Wood having an immediate impact. Three wickets and bowling at 95mph!! His opening deliveries, some of which reached 90 miles per hour, troubled Shai Hope and so it was no surprise to see him slice to Burns at gully, the same fielder then hanging to another chance to send Roston Chase back for a golden duck. Wood's extra pace was proving too much and he found Shimron Hetmyer's outside edge before tea, Root holding on at the second attempt at first slip. Durham seamer Wood then had four wickets for the first time in a Test with his seventh ball of the third session, Darren Bravo picking out Root again in the cordon. Keemo Paul (9) and Dowrich (38) managed to take the hosts into three figures, though the former would perish when stumped off Moeen. Dowrich eventually fell lbw to Stuart Broad, who then took a brilliant one-handed catch from over his head after Joseph launched Moeen into the sky. That left both Moeen and Wood on four wickets each, and it was the latter who would finish with five as he rattled Gabriel's stumps. Burns (10) and Jennings (8) then negotiated the final 10 overs of the day without much drama - though the former almost edged to first slip in the final over - to raise hopes of a consolation victory for England. 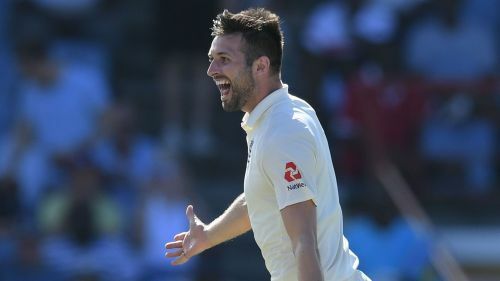 West Indies vs England 2019: Was Mark Wood's St. Lucia effort just a flash in the pan?